JMA issued a warning on 24 March for the waters surrounding Myojinsho after reports from the Japan Coast Guard indicated discolored water from a possible eruptive event. Light green discolored water, centered over the vent in a fan-shaped zone ~8 km long, was seen from the air on 18 March. The next day, a circle of light green discolored water ~1.8 km in diameter was visible. The submarine volcano Myojin-sho exploded on 29 January between 1400 and 1600 hours. Located at 31°N, 139°59.5' E, the volcano shot a 200-300-m-wide water spout 100 m into the air at 1420, 1435, and 1443 hours. The explosions were accompanied by sulfur-colored smoke, as reported by the fishing boat Shintokumaru ##2. Another boat, the Shintokumaru ##12, reported five or six similar explosions, each of 3-4 minutes duration, at 1540 hours. The Myojin-sho Reef in the Pacific erupted again at around 1040 [on 7 February], the 3rd Regional Maritime Safety Agency Headquarters in Yokohama revealed. The eruption was reported by the fishing boat No. 2 Shintoku Maru, which was sailing near the volcanic reef, located 150 km S of Hachijojima Island. According to the report, the eruption was greater in scale than the previous one which had occurred 29 January. Crew members of the fishing vessel witnessed great clouds of spray and seawater of dark-red color around the reef. Card 0859 (04 February 1970) Tokiko Tiba, National Science Museum, Tokyo, Japan. Card 0866 (13 February 1970) S. Motoda, Hokkaido University, Hakodate, Japan; W.H. Littlewood, American Embassy, Tokyo, Japan. "The submarine eruption of Myojin-sho on 29 January was detected by sofar hydrophones of the Pacific Missile Range at Wake and Midway Islands. The origin time for the first explosion was 0330 GMT; for the last 1153 GMT. Eight large explosions occurred between 0330 and 0639, five between 0925 and 1012, and continuous high level activity between 1020 and 1110 GMT. "Nine strong explosions from Myojin-sho originating between 0245 and 0511 GMT, 13 February, were recorded by the sofar hydrophones of the Pacific Missile Range at Wake and Midway. The hydrophones also recorded strong signals from the direction of Myojinsho on 14, 16 and 17 February with the strongest activity at 1044 GMT 17 February. One explosion was recorded on 25 February originating at 1914 GMT." Information Contacts: Rockne H. Johnson, Hawaii Institute of Geophysics, University of Hawaii, USA. The following information was passed to the Center via the American Embassy. Myojin-sho erupted again 23 April according to a report reaching Shizuoka from the Japanese fishing boat Kaigyo Maru of Izu, Shizuoka, Prefecture. The crew of the Kaigyo Maru witnessed the eruption at a point 50 km SE of the reef. It sent a column of water and smoke 200 m high. Information Contacts: Japanese Fishing Fleet, Izu, Kyodo, Japan. "The submarine volcano Myojin-sho exploded on 23 April 1970. Fishing boats, the Kairyu-maru and the 7th Kinosya-maru, reported as follows: 23 April, 0620 JST: explosion; water spout was given out 200-500 km high and about 100 m wide. 0630 -0637 JST: explosion. 0710 JST: explosion; volcanic smoke was observed to be 20-30 m high. After this, there were three to four explosions until 0800 hours on the same day. Water spout seemed to be higher than 200 m. The JMSA (Japan Maritime Safety Agency) observed the states of the submarine volcano from the air at 1125-1200 JST on 23 April and reported as follows: Sea water, about 100 m across, above the submarine volcano, was discolored by sulfur. A yellow belt of water discolored with sulfur, 1,000 m wide and 2,000 m long, moved in the SW direction from the discolored zone. At the front of this belt was a floating pumice zone 50-100 m wide and 1,000 m long, seemingly emitted on the occasion of the observed explosions. At 1100-1140 JST on 1 May, the members of JMA and JMSA observed this volcano from the air. No volcanic island above sea-level was seen, but light green sea water above the volcano suspended with sulfur or ejecta from the submarine-crater was observed (across 50-60 m). A discolored belt of water from this suspended zone was observed to move in the SE direction and to be 50-60 m wide, several hundred meters long. The sea temperature near this submarine volcano was measured with an infrared thermometer from the airplane but an extraordinary temperature was not detected." Information Contacts: Yosihiro Sawada, Japan Meteorological Agency, Tokyo, Japan. "In the morning of 18 June 1970, members of the fishing boat the 3rd Zinkokumaru observed the bubbles of a submarine volcanic explosion under sea-level about 50 m deep. Much pumice (max. 40 cm across) was floating near the sea surface above the submarine crater." After 10 years of inactivity, discolored water was observed on 13 July 1979 at Myojin-sho. The crew of the fishing boat Suitenmaru 11 saw discolored water over Myojin-sho on 15 November at around 1530. They reported that no discoloration had been seen there that morning. JMSA personnel flew over the site on 18 November and observed three circular areas of pale green water, each 50-80 m across, aligned within a 300-m zone. [Discolored water was] also seen the following day by the crew of the fishing boat Shinkomaru 26 and again by JMSA personnel on 26 November. No floating ejecta or upwelling of water were noted, however. 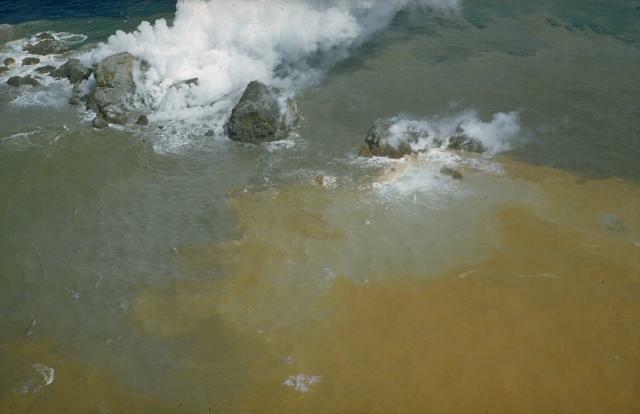 Discolored water within a 100-m radius of Myojin-sho, the central cone of the submarine volcano, was recognized by observers on a fishing boat at 1040 on 21 October. No discolored water had been seen at 0603 that day and none was seen the next day during a JMSA overflight. Beyonesu Rocks represent part of the barely exposed rim of the largely submarine Myojinsho caldera. Formation of the 8-9 km wide caldera was followed by construction of a large (2.6 km3) lava dome and/or lava flow complex on the caldera floor, originally located at a depth of 1000-1100 m. Most historical eruptions, recorded since the late-19th century, have occurred from the large post-caldera Myojinsho lava dome on the NE rim of the caldera. Deposits from submarine pyroclastic flows associated with growth of the dacitic lava dome mantle the conical dome and extend into the NE part of the caldera and down its outer slopes. An explosive submarine eruption from Myojinsho in 1952 destroyed a Japanese research vessel, killing all 31 on board. Submarine eruptions have also been observed from other points on the caldera rim and outside of the caldera. The Beyonesu Rocks were named after the French warship the Bayonnaise, which was surveying volcanic islands south of Tokyo Bay in 1850. Fiske R S, Cashman K V, Shibata A, Watanabe K, 1998. Tephra dispersal from Myojinsho, Japan, during its shallow submarine eruption of 1952-1953. Bull Volcanol, 59: 262-275. Niino H, 1953. Report on the submarine eruption of Myojin-sho, Part 2. The second survey of Myojin-sho. Tokyo Univ Fisheries, 40: 33-43 and 5 plates. Niino H, Kumagori T, Tsuya H, Morimoto R, Ossaka G, Hamaguchi H, Tatsumoto M, Matsue Y, Komai Y, Arihasa C, Ebina K, Takagi K, 1953. Report on the submarine eruption of Myojin-sho, Part 1. First survey of Myojin-sho. Tokyo Univ Fisheries, 40: 1-32 and 24 plates. Suwa A, 1978. The surveillance of volcanic activities in Japan. Bull Volc Soc Japan (Kazan), 23: 83-89 (in Japanese with English abs). Ueda Y, Onodera K, Ootani Y, Suzuki A, 2001. Geophysical structure of the Myojin-sho caldera and its volcanological interpretation. Bull Volc Soc Japan (Kazan), 46: 175-185 (in Japanese with English abs). Yuasa M, 1995. Myojin Knoll, Izu-Ogasawara Arc: submersible study of submarine pumice volcano. Bull Volc Soc Japan (Kazan), 40: 277-284 (in Japanese with English abs). There is no Deformation History data available for Myojinsho. There is no Emissions History data available for Myojinsho. An explosion from the Bayonnaise Rocks submarine volcano in Japan's central Izu Islands breaches the sea surface on September 23, 1952. 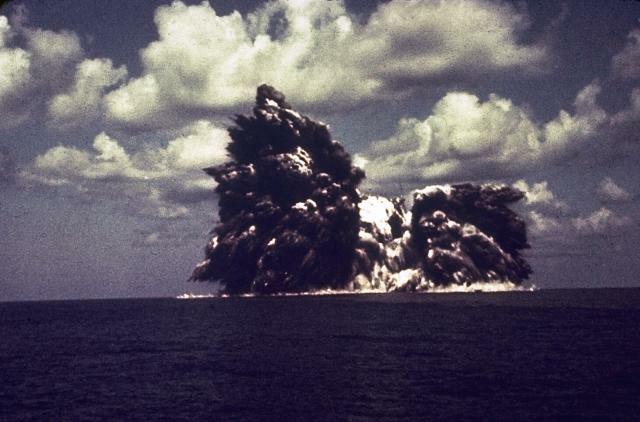 These cockscomb-like projections of blocks and ash are characteristic of shallow submarine explosions. This photo was taken 5 seconds after the explosion penetrated the sea surface. Five minutes later the eruption was over and the sea was again calm. The suddeness of these powerful explosions proved to be fatal to 31 people on a research vessel that sailed over the vent the following day. Photo courtesy of Ryohei Morimoto (University of Tokyo), 1952. 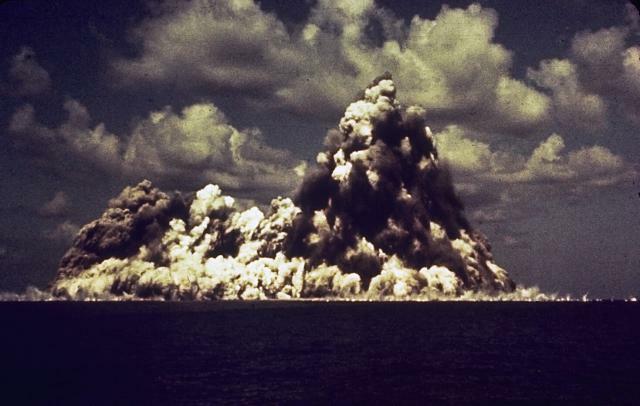 A submarine explosion at Myojin-sho lava dome on the rim of Bayonnaise Rocks caldera in the central Izu Islands on September 23, 1952, displays both a vertically rising plume of ash and steam and a basal portion traveling horizontally across the sea surface. This photo was taken 8 seconds after the explosion first breached the surface. The eruption began on September 16, when a lava dome slowly rose above the sea surface. Explosion activity then intermittently destroyed the dome. This cycle continued three times until October 1953. Photo courtesy of Ryohei Morimoto (University of Tokyo). Steam pours from the blocky summit of a lava dome formed at Myojin-sho during a submarine eruption at the Bayonnaise Rocks volcano in 1952. This September 22 photo was taken six days after the dome began to breach the sea surface. Later that day the eruption became highly explosive, and the dome was destroyed. Three cycles of dome growth and destruction occurred until October 1953. Myojin-sho is located on the eastern rim of a 7-9 km wide submarine caldera. Photo courtesy of Helen Foster, 1952 (U.S. Geological Survey). There are no samples for Myojinsho in the Smithsonian's NMNH Department of Mineral Sciences Rock and Ore collection. Large Eruptions of Myojinsho Information about large Quaternary eruptions (VEI >= 4) is cataloged in the Large Magnitude Explosive Volcanic Eruptions (LaMEVE) database of the Volcano Global Risk Identification and Analysis Project (VOGRIPA).